Last week, I discussed Britain’s desire to reduce debt and costs of maintaining their colonies. Parliament decided it was time to get the American colonies involved in paying these costs. As a result, Parliament passed the Sugar Act and the Currency Act in 1764. No one likes paying more taxes of course, but conditions in the colonies made the new laws particularly difficult on the colonists. The end of the war led to an economic depression in the colonies. All that money that had been flowing into the colonies during the war was drying up. Military contractors and militiamen with payroll money to spend had been a boon to colonial business. Now, virtually all of that was gone. With the war in Europe now over, many merchants began to invest in new ships and inventory to take advantage of expected trade. Yet, debt in Britain and Europe meant that demand for colonial goods also fell. In 1763-64, many merchant firms went bankrupt, thus contributing to the economic problems. Veterans returned home, looking for work and finding none. Unemployment reached dangerous levels. Wealthy Virginia planters found themselves in particular trouble as tobacco prices plummeted. Credit in London dred up and demands for payment of old debt increased. The end of the Seven Years War in Europe led to a collapse grain prices, which in turn caused commodity traders in Amsterdam to take huge losses and banking crisis. Amsterdam bankers who held much of Britain’s debt, began calling in loans, in turn making made London creditors desperate for cash. London creditors therefore made concerted efforts to collect from their debtors in the colonies. So, as the British cut back on military spending in America, private creditors demanded repayment of loans. The Currency Act prevented colonial governments from creating paper money and trade restrictions of the Sugar Act prevented merchants from bringing in hard money from other parts of the world. One normal outlet for such tough times, land speculation, was largely curbed by the prohibition on settlement west of the Allegheny Mountains. The only colonists settling west of the Alleghenies were illegal squatters, who were not going to pay eastern land speculators. Even worse, Pontiac’s War was still in its late stages, meaning many western settlers were still seeking refuge, and needed economic support further east. Ever decreasing available land east of the mountains was revitalizing old rivalries that had been put aside during the war. Border disputes between New Hampshire and New York, as well as Connecticut and Pennsylvania flared up again. Pennsylvania and Maryland returned to internal power struggles between the governor and legislature. Even tiny Rhode Island was hopelessly divided by political faction. It did not help matters in New England that a financial crisis exploded in January 1765. There were no banks in North America at this time. As a result, private men of substance, trustworthy members of the community, would often take deposits and offer interest bearing notes to the depositor. Nathaniel Wheelwright ran the largest such enterprise in New England. From a prominent New England family, Wheelwright was a well respected merchant and trader. He greatly increased his already substantial wealth as a contractor during the war. Like many merchants, though, Wheelwright over extended himself and regularly took financial risks in order to increase his profits. In the postwar recession of 1764, Wheelwright found himself undercapitalized and unable to pay his debts. Faced with imminent scandal and debtors prison, Wheelwright skipped town in January 1765 for the island of Guadeloupe, where he died a few months later. The Wheelwright bankruptcy hit New England harder than any of the recent Acts of Parliament. He had outstanding notes totalling over £170,000 due to be paid to almost all the merchants in Boston, on down to hundreds of poorer working class depositors. The possibility of repayment of those debts disappeared into the night along with Wheelwright, leaving everyone without their money. The sudden disappearance of £170,000 in the already cash strapped colonies sent shockwaves through the economy. Depositors suddenly found themselves unable to pay off other debts. Debtor prisons began to fill and bankruptcy court filing swelled. Lt. Gov. Thomas Hutchinson held a number of different offices, including Chief Justice of the Superior Court. He issued dozens of warrants for the arrest of debtors and the seizure of property, collecting a sizable percentage for each case. Hutchinson’s vigorous enforcement of these cases only increased the already sizable percentage of the colony that actively hated him. His name virtually became a curse among the merchant community. More generally, the scandal depressed the local economy for several years as lawyers and merchants attempted to dig out of the financial mess. 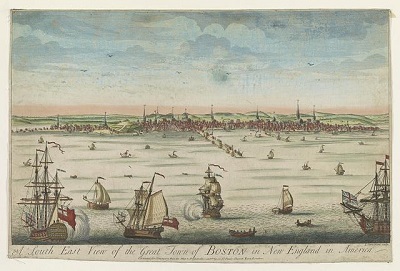 Although the recent currency act did not apply to Massachusetts, as an earlier law already restricted paper money, the Wheelwright scandal provided a prime example of why more local control over economic crises was critical, and why the local population thought this year especially was not the time for London to extract more money from the region through tariffs. Amidst these economic problems came news of the Sugar Act and the Currency Act during 1764. These acts, making much of New England’s trade far less profitable, only put more colonists on the street without jobs. Denying colonial legislatures the ability to float more paper money as they tried to retire war debt created local tax pressures as well. The resulting currency deflation only made it even harder for debtors to make repayment. The Colonial response to the new laws was in part practical: you cannot drain more money out of the economy at just the time we are sinking into a post-war depression and in part ideological Parliament has no right to place such restrictions on the colonies. Almost no one thought Parliament’s 1764 Acts were good policy. 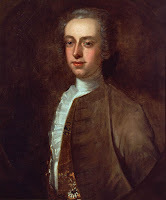 One of the first men to make a principled argument against the new laws was James Otis. The Massachusetts lawyer, who we last saw in Episode 17, had opposed British attempts to use general warrants to look for smugglers in 1761. In 1764, Otis published The Rights of the British Colonies Asserted and Proved in response to the Sugar Act. The work itself is rather vague, not even referencing the Sugar Act, the British Parliament, or the power of taxation. Rather, it focuses generally on the right of the people in a society to have a government that meets their needs. It borrows on the social contract theory expressed by British philosophers such as Thomas Hobbes and John Locke and expresses in general terms that tyranny is bad. In the context of the debate though, it was taken as advocacy for the idea that colonial legislatures, which are the true representatives of the people, were the ones empowered to make such decisions. Any attempt to raise revenue by any other body, including Parliament, was tyranny and a violation of fundamental rights. In a series of subsequent articles where Otis attempted to debate with opponents, he ended up muddling his arguments even more. As a result, little came of it. We mostly remember the essay because many of its basic principles eventually found their way into the Declaration of Independence. These writings did help cement Otis’ reputation as an early leader opposed to Parliament’s colonial policies. But what still heightens our apprehensions is, that these unexpected Proceedings may be preparatory to new Taxations upon us: For if our Trade may be taxed why not our Lands? Why not the Produce of our Lands & every thing we possess or make use of? This we apprehend annihilates our Charter Right to govern & tax ourselves--It strikes at our Brittish Privileges, which as we have never forfeited them, we hold in common with our Fellow Subjects who are Natives of Brittain: If Taxes are laid upon us in any shape without our having a legal Representation where they are laid, are we not reduced from the Character of free Subjects to the miserable State of tributary Slaves? This was the soon to be familiar argument against taxation without representation. If Parliament could levy any revenues on the colonies, and the colonies had no voice in Parliament to object, Parliament’s taxes could only grow in form and size without check. Therefore, Parliament had no such authority. 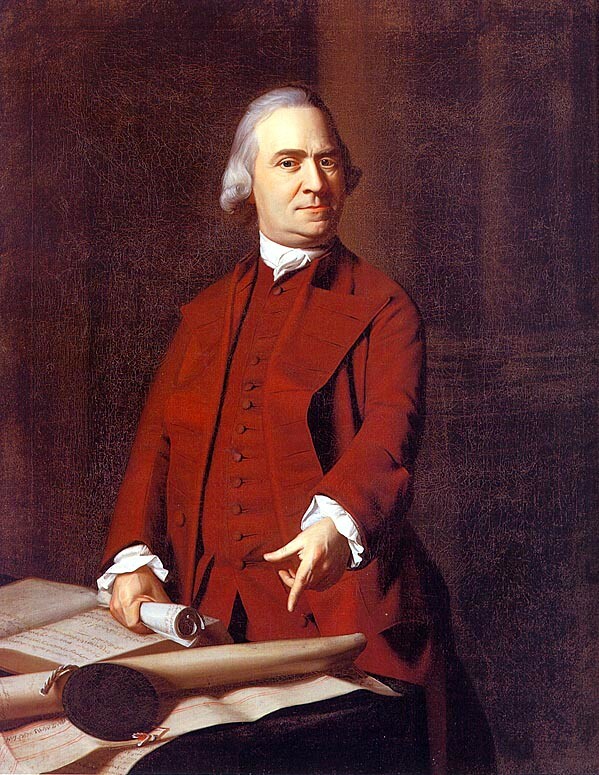 One author on the committee that wrote those words was a middle aged bureaucrat named Samuel Adams. Adams had been interested in radical politics. His 1743 master’s thesis at Harvard argued that it was "lawful to resist the Supreme Magistrate, if the Commonwealth cannot otherwise be preserved." 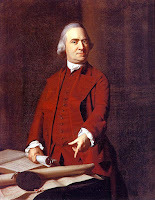 His father, Samuel Adams Sr. had been a wealthy Boston Merchant. Samuel Jr., like his Father and Grandfather, joined the Boston Caucus, a local political organization that debated issues and worked on local projects for public improvement. Adams spent his formative years learning how Boston politics worked. By the 1760’s he had already failed at a number of jobs, including work as a malter for making beer. He was a local tax collector, but was doing a pretty terrible job at it. Mostly, it seems, he was building his reputation as a political leader in opposition to Parliamentary authority generally and Lt. Gov. Hutchinson in particular. Adams had become a popular leader of the Caucus in the 1750’s when a major focus was subverting the onerous tariffs and customs duties of the Molasses Act. 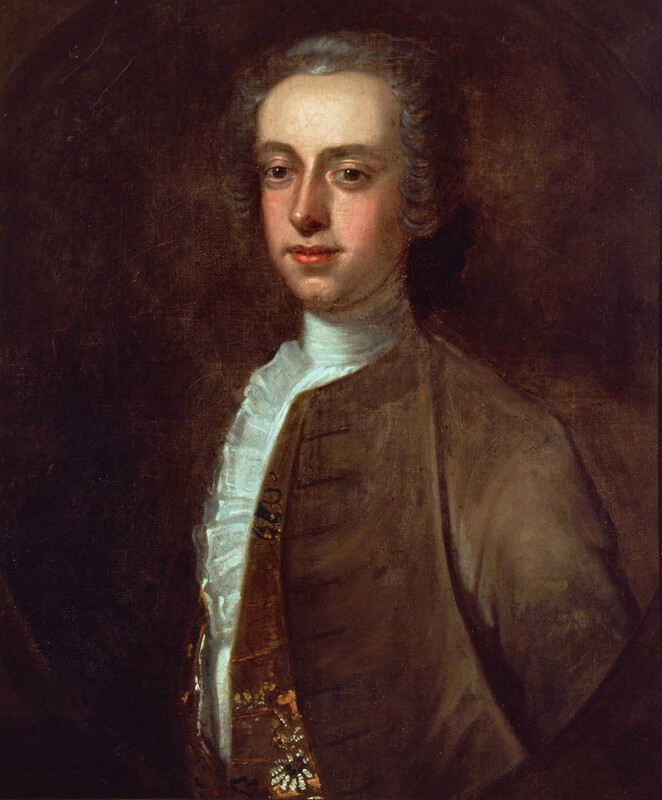 Adams realized that his path to power was not so much writing lofty protests like James Otis, or seeking appointments from those at top of the government. Rather it was harnessing the combined power of wealthy merchants and that of the working class people who dominated Boston and its harbor. At the time, there were two informal groups for the working class in Boston. One in North Boston led by Henry Swift, a local shipwright. Another in South Boston, was led by a shoemaker named Ebenezer Mackintosh. Mostly the groups fought one another in an annual “Pope’s Day” event on Nov. 5, commemorating the day in 1605 when a Catholic named Guy Fawkes tried to blow up Parliament. In strongly anti-Catholic Boston, the day had been celebrated as a day to attack Catholics generally and the Pope specifically, often burning him in effigy at a city-wide event. The event had become an excuse for a drunken party. Over the years, the rivalry between the north-side and south-side gangs had resulted in massive brawls, that usually left many injured and occasionally a few dead. Needless to say, the groups did not mix together much. When they did, it usually led to blows. Adams, however, had friends among both groups and was well respected in both north and south Boston. It was a testament to his political influence among the working classes. 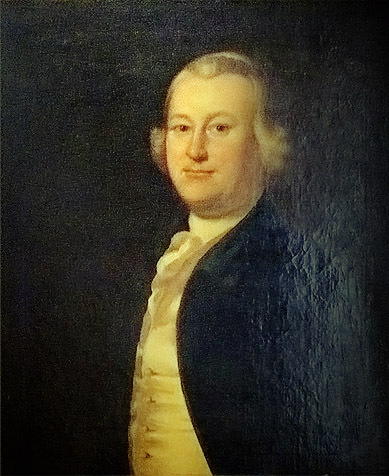 Adams not only worked with merchants and the elite to issue protests over the Sugar Act, he was slowly building a political base of power among the poorer working class of Boston, hoping to harness that to use against government elites like Bernard and Hutchinson, as well as Parliament’s anti-colonial policies. All sides of the Colony’s political spectrum opposed the Sugar Act. Lt. Gov. Hutchinson was less outspoken but made clear his objections to Parliament’s actions as well. In addition to his multiple political offices, Hutchinson was also a merchant trader and had much to lose from the new law. However, when he wrote London about the colony’s concerns, he focused on the hardships the new law caused. He ignored the arguments about colonial rights against Parliamentary taxation, thinking it would only force Parliament to dig in its heels. He was probably right about that. But the rather mild point that taxes were tough on the colony did not sway anyone for repeal either. But an Exemption from the Burthen of ungranted, involuntary Taxes, must be the grand Principle of every free State.-Without such a Right vested in themselves, exclusive of all others, there can be no Liberty, no Happiness, no Security; it is inseparable from the very Idea of Property, for who can call that his own, which may be taken away at the Pleasure of another? Other colonies issued less strident protests. Rhode Island’s legislature submitted a petition to the king which argued that “colonists may not be taxed but by the consent of their own representatives, as your Majesty’s other free subjects are.” Connecticut issued a pamphlet opposed to internal taxation, but expressing no objection to tariffs. Pennsylvania was in the middle of a fight to oust the Penn family and convert the government to a Royal colony with a governor appointed by the King. The legislature directed its London agent to protest the law and to lobby against a possible Stamp tax. It did not send a formal petition directly. The legislature sent a second agent to London, Benjamin Franklin, who mostly went to lobby to make Pennsylvania a Royal Colony, and hopefully be appointed the colony’s first royal governor. Virginia sent a petition to the King, as well as protests to both the House of Lords and the House of Commons. In each, they focused on the concerns that they had a fundamental right to be taxed only by their local legislature, in whom they had representation. To accept taxation from an outside body was akin to slavery, which as we all know is not a proper condition for British people at least. Virginia’s petitions also focused more on the Currency Act, which was simply killing the colonial economy. Not all reactions were in the form of political protest. Some merchants, taking the pessimistic view that this was the beginning of an era of more oppressive trade restrictions, began looking for other ways to supply the colonies. Some merchants began making plans to distill more alcohol from locally grown corn, rather than continue to rely on imported molasses. Many began to increase their stock of sheep with an eye toward developing a domestic woolens and linens industry in the colonies in order to cut down on the necessity of British imports. Even if London won the political fight, colonists were already beginning focus economic reactions that would deny Parliament the revenues they hoped to obtain. If the legislative protests were not forceful enough, it quickly became clear to many that despite better enforcement mechanisms, resistance would continue. There are many examples of resistance, but one of the most celebrated involves a sloop named the Polly. John Robinson arrived in Newport Rhode Island as the new customs agent. He was tasked with enforcing the new tariffs and by all accounts seemed motivated to do so. When the Polly entered the harbor in April 1765, the owner reported and paid the tariff on 63 barrels. After the ship left harbor, Robinson decided that the shipment seemed rather small for a ship of that size. He boarded the Maidstone, a British Man-of-War, which caught up with the Polly at Dighton in Massachusetts. While not part of the legislation itself, Grenville also had twelve navy vessels, freed up by the end of the war, assigned to the east coast of America looking for merchant ships trying to evade tariffs. The navy had authority to board vessels, demand inspections of cargo, and impound ships in violation of trade laws. Because the ship’s officers and men received a share of any seized vessels and cargo, they had every incentive to act aggressively and capture whatever they could. Customs officials could make use of these ships to enforce the Sugar Act and other trade laws. After the Maidstone caught up with the Polly, Robinson conducted a full search and determined that the ship had declared only about half its cargo. Pursuant to law, the vessel would be seized and sold. The ship’s crew refused to assist, nor could Robinson find anyone else in the area to return the ship to Newport. He left an assistant in charge while he returned to Newport to collect a crew. Before he could return, about 40 men with blackened faces boarded the ship, and removed the cargo, along with just about anything else of value. They also damaged the vessel to prevent it from being sailed back to Newport. When Robinson returned, with sailors and marines, he asked the local justice for writs of assistance so he could find the thieves. The Justice refused and told him it could not issue the writs. The Justice further informed him that he and the 40 marines and 30 sailors with him were in danger of being attacked by unknown armed men. Robinson wisely gave up his pursuit of the attackers, and returned to the Polly to attempt to put it in condition to sail back to Newport. Before he could effect repairs, the sheriff arrived with a warrant for his arrest. The ship’s owner had filed a complaint against him for damages. He spent three days in jail before the Surveyor of Customs could arrive with bail. Under the protection of a British Man of War, Robinson was able to make the ship seaworthy and removed it from Dighton. He hoped to sail it to Halifax for condemnation so it could be sold. However, Massachusetts Gov. Bernard intervened to protest its removal from local courts. The legal wrangling continued for over a year before the Polly was finally condemned and sold. The story is emblematic of the problems customs officials had enforcing this highly unpopular law. They could be subjected to mob justice, and face harassment by local authorities who also opposed their actions. The merchants were respected members of the community who provided most of the jobs. Customs officials were seen almost as thieves pulling money out of the colony unjustly. Without the backing of the British Navy on just about any significant action, there was no way they could do their job properly. Resistance was rarely violent, but it clearly existed at all levels, from the Governor, to the merchants, to the courts and sheriffs, to the common people in the streets. Everyone clearly opposed the tariffs and would do whatever they could to make them unenforceable. Next week, Parliament passes the Stamp Act and Quartering Act in 1765.